The Half Pipe Rampage is an amazing new tube that offers a thrill ride for one OR two people sitting, kneeling, in the prone position, or even sideways! The angled sides give this tube sensational action on the water while maintaining a great deal of stability. Also includes bright printed graphics on a full nylon cover, EVA foam body pads for each rider, and handles all over. 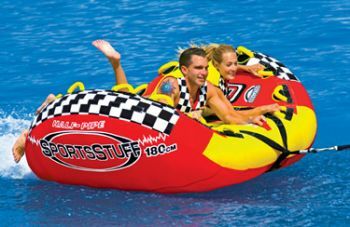 Use for a smooth, stable ride or tilt the tube on its side for tight turns and wild wake action.